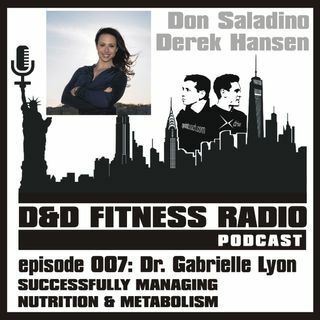 In Episode 007, we speak with Dr. Gabrielle Lyon about the issues around nutrition and your metabolism. While everyone is searching for the most effective ways to lose weight and look better, there are key fundamentals that apply to each individual to ensure that you are eating right for your body, but also your gut and brain health. We discuss diet and exercise, intermittent fasting, alleged food allergies and many other topics related to health and nutrition. Dr. Gabrielle Lyon is a ... See More fellowship-trained nutrition and cognition physician who specializes in muscle-centric medicine. As co-leader of The Ash Center for Comprehensive Medicine in Manhattan, she utilizes a truly integrated background to restore and invigorate this organ of longevity. Her deeply personalized approach emphasizes the health of muscle itself. To this end, Dr. Lyon leverages cutting-edge science to precisely fine-tune metabolism, balance hormones, and transform body composition. Through advanced nutritional interventions, metabolic and genetic testing, and behavioral action plans, she leaves no stone unturned. And by establishing a strong partnership with each patient, the success achieved is long lasting. Trained as a Doctor of Osteopathic Medicine who is board certified in family practice, she also completed two years of study in psychiatry at the University of Louisville. Her formal education culminated in nutritional science and geriatrics research at Washington University in St. Louis. Dr. Lyon currently directs her attention to the interface between brain health and body composition optimization. She is uniquely situated to finally bridge the gap between the research and patient care arenas, for she possesses the necessary vision to translate the latest information available into life-altering results for her patients.